While a pot as big as a stockpot isn’t called upon often in home kitchens, when you need to make a big batch of stock from a mess of saved bones and aromatic vegetables, there’s just no way around needing something that can handle a lot of volume. Turning to your six-quart Dutch oven, or the eight-quart pasta pot that comes with most cookware sets, can be too limiting for large batches of stock. Stockpots are also our go-to for crowd-feeding dishes like lobster boils. You can spend close to $400 on a stockpot, but does spending more get you a better pot? To find out, we rounded up 14 models, ranging from around $34 to nearly $383 (at the time of testing), and put them through handling and cooking tests to find the designs that work best. The Cuisinart MultiClad Pro’s build is rock-solid, with riveted handles, a snug-fitting lid, and triple-ply stainless steel cladding (a core of aluminum sandwiched between layers of stainless steel) from the base to the top of the pot’s wall. The wide, flat handles are very comfortable and leave plenty of space for oven mitt-covered hands. The thick base layer manages heat well, which means you’re less likely to burn your food. If you’re the type of cook who forgets to use oven mitts when reaching for hot pots, the rubbery grips on the Cook N Home stockpot might just save you from a painful burn. This stockpot has a disc of stainless steel and aluminum cladding on the bottom only, which shouldn’t present a problem in most cooking scenarios. Still, you’ll need to pay closer attention because food has a tendency to scorch more quickly in this pot than in our top pick. 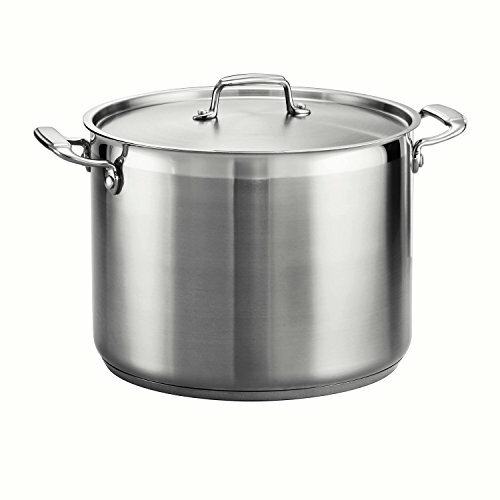 We think most home cooks will be well served with a 12-quart stockpot, but if you know you need a bigger size—to make larger batches of stock, huge pots of soups, or lobster boils for a very large crowd—then you may want to consider owning a 16-quart pot as well. The Tramontina is our top pick for this larger size. It shares the same build quality as the 12-quart version, which we also tested. Its shortcoming are minor, and, for the price, it’s the best we found. How easily and securely you can grab a stockpot matters, especially when it’s filled with quarts of hot stock, soup, or sauce. Buying a stockpot can be a tricky purchase. Because of the pot’s size, it can be very pricey, but you really don't need the same level of performance that you require from a skillet or sauté pan. A stockpot’s primary purpose is to simmer or boil liquids, so the cladding and even heat conduction of the more expensive options are less necessary than they would be in a pan tasked with searing and sautéing. The goal is to buy a stockpot that will last, but without spending for a build quality that you’ll rarely rely on. The handles have to be comfortable, sturdy, and easy to grip—the last thing you want to feel is uncertainty as you move a large pot of scalding water off the cooktop or while draining through a strainer. For home use, stockpots come in a range of sizes, usually from 8 to 20 quarts (some commercial kitchens use massive 74-quart versions). For most home kitchen tasks, we think a 12-quart stockpot is an ideal size and large enough for making big batches of stock or sauce. Going with a smaller stockpot, like one that’s eight-quarts, means the pot is very similar in volume to a six- or eight-quart Dutch oven. It pays to get a stockpot that’s bigger than your other pots, yet still fits inside a base cabinet, to cover the biggest cooking tasks while avoiding pot-size overlap. For more capacity, a 16-quart stockpot is just about as big a pot as most home kitchen burners can handle. While researching which models to test, we focused on stainless steel pots that are compatible with an induction burner, which provides more flexibility. We excluded stockpots made from aluminum, which reacts with acidic ingredients and can warp when used with high heat. We also ruled out pots made with enameled steel, which is used for sautéing and browning, or those with non-stick coatings that excel at cooking eggs, fish, and battered foods like pancakes. Both of these finishes can wear out over time. A big driver of a pot’s cost is the cladding, that is, the multi-layer sandwich made up of (usually) a layer of conductive aluminum between two slabs of stainless steel, and how much of it there is in the pot— you’ll see this often marketed as tri-ply or multi-clad. 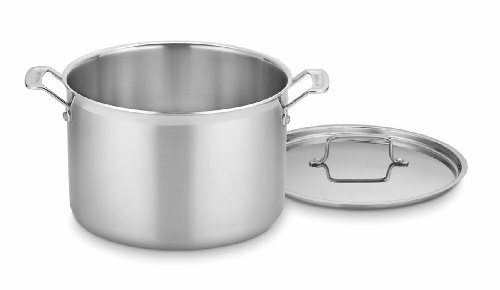 Typically, the more expensive stockpots (and cookware in general) have full cladding that covers the bottom and sides of the pot, while less expensive models have cladding only on the bottom. For stockpots, in which you're usually cooking liquids, the full cladding is less important because you don't have much risk of food scorching on the sides when the pot is full of water (full cladding is more important for drier cooking methods like searing and sautéing). That said, a fully clad pot is always preferable, but not if the cost is unreasonable and the need isn't as pressing. Our test field included both fully clad pots, like the All-Clad and our winning Cuisinart, as well as pots that have cladding only on the bottom. Full cladding adds weight and cost, but helps manage heat better and reduces the risk of scorching, especially in the corners where the pot wall meets the base. Lids are either tempered glass or stainless steel, and while we didn’t find the material of the lids to affect performance, we generally prefer metal lids since glass can break. Handle design was one of the first features we considered when deciding which pots to eliminate from the test field. Metal handles are typically either narrow and round, or wide and flat. We considered handle size and shape in terms of comfort and ease of holding the pot, both with bare hands and when using both oven mitts and kitchen towels. The space between the handle and the pot is also important: You want enough room to wrap your fingers around the handle while wearing oven mitts or holding a kitchen towel. Handle width plays a part too: We like to get all four fingers across the handle, though the space within the handle felt crowded on some models when we used just three fingers. For durability, we prefer handles that are riveted to the pot over those welded in place. To select specific models to test, we cross-referenced reviews from Amazon and America's Test Kitchen (subscription required). Stockpot handles come in two basic shapes, flat and wide or round and skinny. We found versions we liked, and didn’t like, of both. 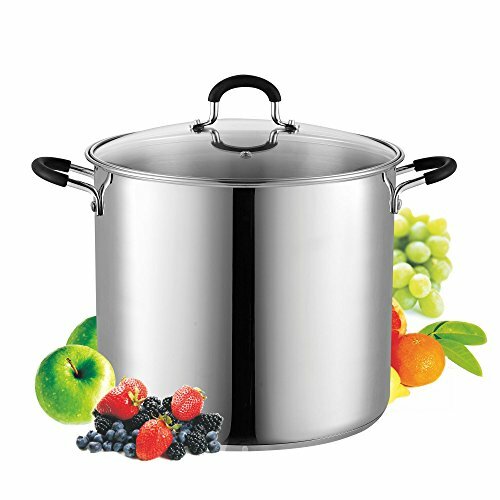 Comfortable, sure handles on a stockpot are important, especially when a full 12-quart pot can weigh about 23 pounds—losing your grip on one when it’s full of boiling liquid is a potentially catastrophic kitchen accident. A good stockpot should have handles that are easy to grab both barehanded and while wearing chunky oven mitts (or with kitchen towels), and you should feel in control of the pot when walking around and while pouring out the contents. We lined up four testers with varying hand sizes and strengths and asked them to pick up each empty pot, with and without mitts and towels, and provide feedback on the handles. It didn’t take long before a pattern emerged: If a pot is uncomfortable to hold while it’s empty, things will only get worse once it’s full. We disqualified several pots for uncomfortable handles, or other basic problems with their build, such as lids that didn’t fit well. We found that handles that are spaced 3/4 to 1 inch away from the pot wall were best, providing enough room to grip the handles without feeling cramped. Some handles were disqualified because their width only left enough space for three fingers to fit, too few to lift a heavy load. We also ruled out a pair of Farberware pots because their handles are welded on, which is a cheaper build than ones attached with rivets (though, it should be noted, we experienced no issues with those welded handles). After disqualifying roughly half the field, we filled the remaining pots with an equal amount of cold tap water and did laps around the test kitchen holding them with bare hands, with oven mitts, and with kitchen towels. Then we dumped the water out to gauge how comfortable they were when being tipped. A stockpot is almost always used to heat liquids—searing and other dry-heat methods of cooking are much less common. The faster a pot can bring water to a boil, the better. We used the exact same amount of room-temperature water (9 quarts) and heat setting (high, on an induction burner) to see how long it took for the contents to reach a rolling boil with the lid on. Most of the pots achieved a boil in 49 to 50 minutes, indicating that whatever small differences there are in terms of a pot’s dimensions and build specs make little difference to its boiling performance. The only exception was All-Clad’s stockpot, which took just over one hour for the water to boil, so we disqualified it. While simmering and boiling is what a stockpot does most often, there are times you want to build flavor in the pot by sweating or even browning aromatics. To test how well the pots performed with this type of cooking, we set each on an induction burner set to medium-high heat for 3 minutes, then added olive oil and a measured amount of diced mirepoix (carrots, onions, and celery). Stirring every 90 seconds, we photographed the vegetables in three, five, nine, and 12-minute marks to confirm even cooking, fond development, and to note any burning. The Cuisinart set itself apart here, gently and evenly browning the vegetables and creating a good, even fond, without any worrying signs of burning on the bottom or corners of the pot. Other pots were more prone to scorching and charring, both on the vegetables themselves and the fond on the pots’ bottoms. Our budget pick, Cook N Home, didn’t manage the heat as evenly as the Cuisinart, but with some careful attention, you can still easily avoid burning the fond. We picked our winners based on handle comfort, boiling, and cooking performance. What we liked: The fully clad Cuisinart MultiClad Pro has comfortable, sturdy handles with a spacious 1-inch-wide gap from the handle to the pot, which is enough room to fit four fingers while wearing a chunky oven mitt. The lid sits snugly and has an easy-to-grab handle. The pot bottom, at 10 1/4-inches wide, was one of the larger ones we tested, and it did the best job cooking the mirepoix without burning. Water in the Cuisinart came to a boil just as quickly as in most of the other pots. What we didn’t like: We’re being picky here, but all that cladding comes with added weight (and cost)—at just under eight pounds, the Cuisinart is more than a pound heavier than the average 12-quart stockpot we tested, which might be an issue for some cooks. What we liked: If you want a stockpot for boiling water or simmering stock, the Cook N Home is a solid choice. When filled to three-quarter capacity, it boiled water as quickly as most of the other pots, and the vented glass lid fits decently well. While the handles are round bar stock, they come coated in a grippy rubber that is comfortable and protects your hand from the hot metal—should you absentmindedly reach for it without an oven mitt or kitchen towel. There is plenty of space between the pot and the handle to grip, but testers with larger hands complained about only getting three fingers to fit instead of four. What we didn’t like: With cladding only on its bottom, the Cook N Home eventually burned some of the fond during our sweating and browning test. What we didn’t like: Just like the 12-quart model, this pot is a little more prone to scorching than our top pick, so you’ll need to pay more attention if sautéing or browning foods in it. There were several pots we disqualified based on handle comfort, build quality, and the lid. These include Farberware’s 12- and 16-quart models, which have welded-on handles. Another 13-quart Cook N Home model had hollow tube handles that stayed cool, but were too narrow to provide a solid grip. The fully-clad Tramontina has an ill-fitting lid. The Calphalon has handles that cut into the palms of our bare hands. The well-built Viking has wide and flat handles, but they were uncomfortably thin. The RSVP Endurance stockpot has handles that are too thin and cramped. The 12-quart All-Clad is America’s Test Kitchen’s winning pot, and it is well built (as is the 16-quart version, which we also evaluated), but it took 10 minutes longer to bring water to a boil. Our winning Cuisinart has a similar build quality, but boils water faster. The Cooks Standard, Tramontina, and Berghoff all have comfortable handles and boiled water in an acceptable amount of time, but they all burned fond during the mirepoix testing.